Instantly boost softness, suppleness and shine! 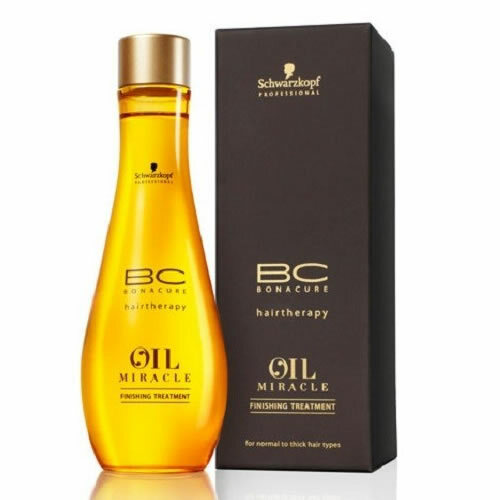 Schwarzkopf BC Oil Miracle Argan Oil Finishing Treatment has been formulated with precious argan oil that boasts high anti-oxidant levels that will help to fortify your clients' hair. Create a long-lasting and healthy shine to hair and add an exotic and fresh scent to it as well. Hair is left with a brilliant suppleness, softness and an eye-catching shine. Simply apply a drop or two to wet hair before blow drying or smooth one or two drops on dry hair for extra shine. £13.56 (inc. VAT) Why no VAT? We're a trade wholesaler and quote our prices without VAT to help our VAT-registered customers understand the true cost of a purchase. A luxurious and opulent treatment that deeply recharges the hair from within the fibre and nourishes it with precious oils. Comes in 150-ml pot or 750-ml bottle.